The 29.73 metre sailing yacht Blue Papillon, jointly listed for sale by Jochen Brill at Northrop & Johnson and Marc Haendle at Ocean Independence, has been sold with Dolphin Yachts introducing the buyer. Built in steel and aluminium by Dutch yard Jongert to a design by Peter Sijm, she was delivered in 1993 and most recently refitted in 2015. Accommodation is for six guests in a full beam master suite and two twins, all with entertainment centres and en suite shower facilities. In addition, there are quarters for four crew in two en suite cabins. In the deckhouse, there is a second steering position, two dining tables, one of which converts to a bed, and an entertainment centre including a large screen Bang & Olufsen television set. Down in the saloon, there is comfortable seating and an entertainment centre including a 50 inch Philips television screen. 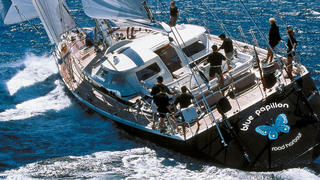 Blue Papillon carries a full wardrobe of North sails and her flush decks have Lewmar hydraulic winches. She is also fitted with Nirvana and Reckmann hydraulic furling systems. An innovation, installed during the 2015 refit, is a table in the deck cockpit on a rise and fall mechanism, transforming it into a large bed to be used as a chill out zone. Included in her sale were her water toys, comprising two tenders, windsurfers, water skis and a brand new Bauer dive compressor. Under power, a single Mercedes OM 423 diesel engine gives her a range of 2,500 nautical miles. Lying in Palma de Mallorca, Blue Papillon was asking €2.2 million with VAT paid.